Hey guys. This is going to be part four in my series “Learning the Letters”. 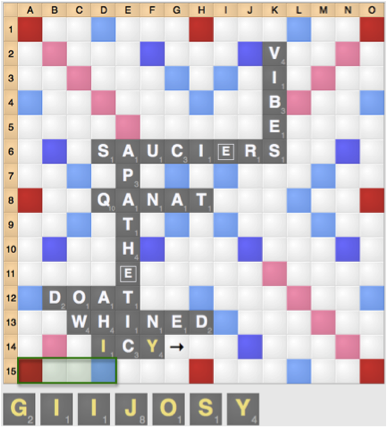 Today, we are going to discuss the S.
The S is the second most powerful tile in Scrabble, largely because of its “plural power”, allowing you to hook words and giving you a lot more flexibility as to where you can play. The S also allows you to create setup plays for your tiles, which is particularly important later in the game if you have one of the only remaining S’s. In general, you should not use the S unless you’re scoring about 10 points extra on your play, although this value must be adjusted depending on the board. While its plural power is obvious, the S also starts far more words than any other letter, making it a potent force for bingos. While it might be your first instinct to look for words that end in S, the S is often at the beginning or middle of bingos as well. With the S, the primary tactic is again to make a setup, creating a word that takes an S-hook to setup a high scoring play on future turns. Creating an S-hook will allow you opportunities for high-scoring plays and bingos. In the left diagram, a play like ICY sets up a scoring line for your S, such as JIGS or JOGS. 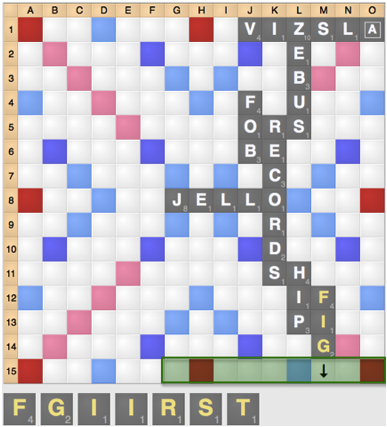 In the right diagram, a play like FIGS creates a bingo line for your S-hook. When you have the last S available in the game, you have a strong and unique advantage, since you can easily set up an S-hook that your opponent cannot easily block. 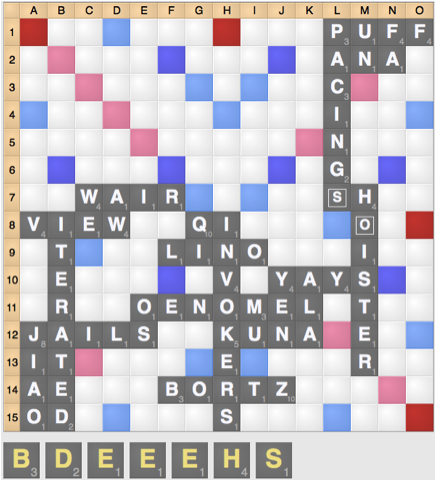 Here, by playing the word BEE n6 (blue) you allow yourself a potentially lucrative S-hook next turn. 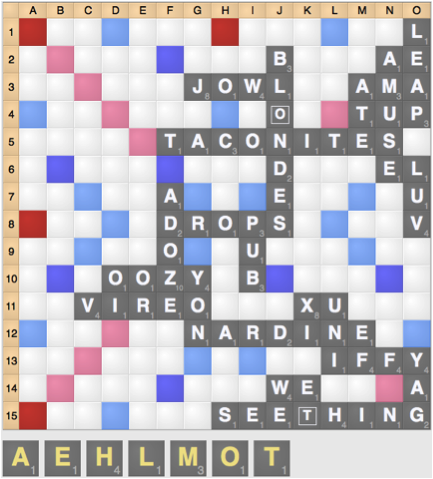 If you’re behind, sometimes you need to hope to draw the S if you want to win the game. Here, you can play MOOCH h2 (blue) in hopes of drawing the S and playing SMOOCH (green) on the TWS next turn for a huge number of points. While this is a really bad tactic when ahead, when behind it can often turn the tide and allow you to win otherwise unwinnable games.